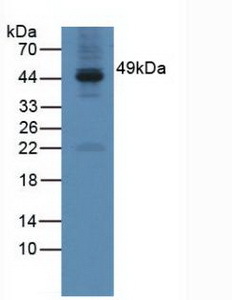 The antibody is a rabbit polyclonal antibody raised against GAL3ST1. 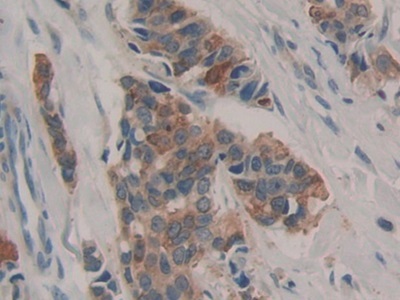 It has been selected for its ability to recognize GAL3ST1 in immunohistochemical staining andwestern blotting. Recombinant GAL3ST1 (Leu57~Phe196) expressed in E.coli. Small volumes of anti-GAL3ST1 antibody vial(s) may occasionally become entrapped in the seal of the product vial during shipment and storage. If necessary, briefly centrifuge the vial on a tabletop centrifuge to dislodge any liquid in the container`s cap. Certain products may require to ship with dry ice and additional dry ice fee may apply. Western Blot: Sample: Mouse Testis Tissue. 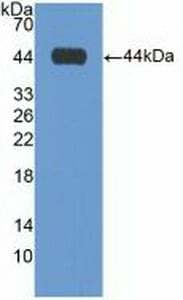 Western Blot: Sample: Recombinant GAL3ST1, Human. 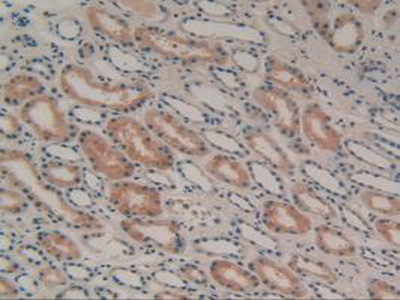 DAB staining on IHC-P; Samples: Human Kidney Tissue. NCBI/Uniprot data below describe general gene information for GAL3ST1. It may not necessarily be applicable to this product. GAL3ST1: Catalyzes the sulfation of membrane glycolipids. Seems to prefer beta-glycosides at the non-reducing termini of sugar chains attached to a lipid moiety. Catalyzes the synthesis of galactosylceramide sulfate (sulfatide), a major lipid component of the myelin sheath and of monogalactosylalkylacylglycerol sulfate (seminolipid), present in spermatocytes. Also acts on lactosylceramide, galactosyl 1-alkyl-2-sn-glycerol and galactosyl diacylglycerol (in vitro). Belongs to the galactose-3-O-sulfotransferase family.